I finally finished my gallery wall! 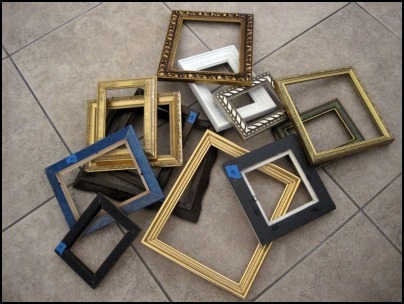 Well, I finally found (more than) enough frames for my project. So, I gutted and numbered all of the frames. 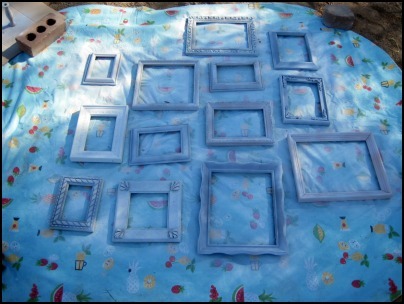 I primed all of the frames with Krylon Primer. I started to spray paint them, but I didn’t like the finish. So, I ended up painting them with a brush and black craft paint. That’s old school right there! I laid the frames out on the floor until I found a design I liked. 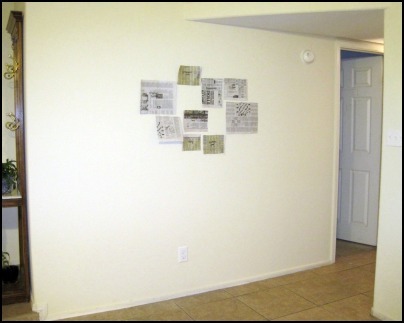 Then I cut out newspaper to test the design on the wall. I hammered some nails and ta-da! 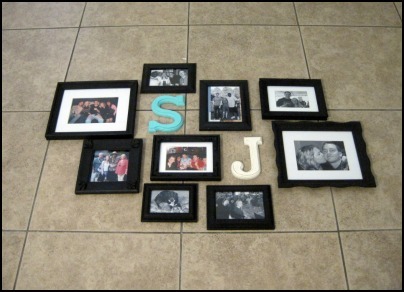 You probably noticed that the S (for Sam) and J (for boyfriend) are different than the S and J from the floor picture. Well, I saw these at Hobby Lobby this weekend and liked them more than the others. Simple as that. There’s more room to expand on the wall. Someday I’ll start collecting more frames, but for now I’m happy to have something on the walls besides a clock. So, you might be wondering why I put my boyfriend’s initial up…Because we are moving in together! Yep, my boyfriend is moving in sometime in August. It’s a big step and we’ve both thought about it quite a bit. We decided that we’re ready, so wish us luck! Looks great! I am doing the same thing, handpainting them too! sometimes its just easier, especially if your frames have lots of nooks and crannies like mine. I'm hoping to have mine done by the weekend, but it may take longer! :) However, once it is up, it will stay forever. Your house is coming along beautifully! Ooooh, how exciting! 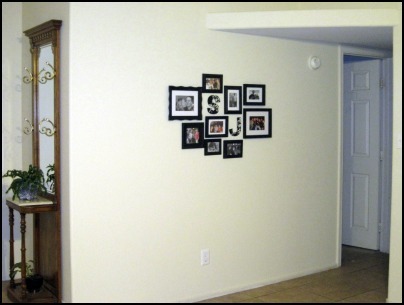 I remember back when my now hubby and I first moved in together. It was like a honeymoon...all cuddles and kisses and love! The frames look fantastic. I have to hit the thrift store this afternoon and am going to totally rip off your idea. I will not wish you luck. I will pray for you to find contentment, commitment, patience, and more love. love they way you arranged the frames! thanks for partying with me! It looks great, Sam! I love all the different frames. I am always on the look out for cool different frames to make a collage too. Hi my mom is the owner of Creative Hands and I am a new follower. 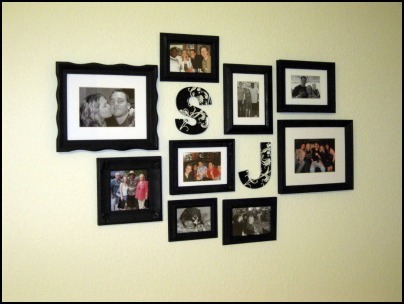 Love the frame idea!! congrats on the boyfriend and I wish you two well together. AAaahhh...Young LOVE! It is so sweet! The Creative Bloggers' Party & Hop became the coolest party on the block because of your participation :) Thank you! that looks really great. The more I see this type of project, the more I want to do it. It's on my "I'll get to it someday" projects, lol. I LOVE it!!! I'm thinking that I need to make a trip over to Hobby Lobby because I love your S and J. And... major congrats on moving in together. I'm excited for you!